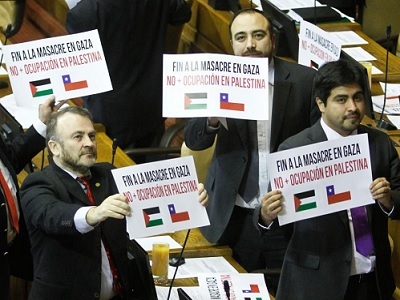 A few weeks ago, a very important conference took place in London organised by the NGO, Middle East Monitor, focusing on Latin America’s engagement with the cause of Palestine. The most striking feature of the conference was the ease with which several speakers, who came from the continent, spoke of Palestine, totally liberated from the inhibitions that obfuscate the discourse on the issue in the West. The most notable inhibition absent from their straightforward support for the human and civil rights of the Palestinians was the fear of being accused of anti-Semitism. We heard in that meeting politicians and professors from South and Central America supporting these rights as an obvious position for anyone with a modicum of decency and humanity in them. They were not walking on eggshells, as their Western counterparts would do, when criticising the criminal policies of Israel on the ground. This openness and transparent discourse indicate how urgent it is to expand the solidarity movement with the Palestinians beyond the boundaries of the West. The guilt-free basis for discussing Palestine can be found also in South Africa and South-East Asia. One cannot stifle and silence a debate there on Israel by intimidating allegations of anti-Semitism. The need to expand the boundaries is important in two additional aspects. It can create an alternative to the failed and destructive notion of Pax Americana – an alternative that would suit not only Palestine but also the rest of the Arab world. Away from Washington, the discussion on peace will extend beyond the agenda imposed by this Pax Americana on the people who live in Israel and Palestine and those engaged with their future. Several assumptions feed the American-led conversation on Palestine, none of them relate to justice and reconciliation. On the contrary, the powers that be regard these two concepts as anathema to a successful peace process. The first assumption is that the conflict in Palestine began in 1967 when Israel occupied the West Bank and the Gaza Strip; hence, peace is a discussion only about the fate of these two areas (excluding any other issues such as the right of the refugees to return). The second assumption is that these territories had to be partitioned in order to satisfy Israel’s security worries. This assumption is associated with the insistence that if you wish to settle a conflict only the interests of the stronger side in the conflict matters and peace mediation is actually forcing the weaker part to accept the dictate of the stronger one (which, as admitted recently by the Norwegian mediators of Oslo was their guiding logic too). The final assumption is didactic. Should the Palestinians reject a “generous” Israeli offer, the next one will justifiably be less generous. The reason for offering less in every curve of this journey to nowhere is not only vindictive. With every passing year, Israel creates irreversible facts on the ground that force the mediators to shrink further the future Palestinian state both territorially and essentially. The proposals humiliate and offend even the most collaborative Palestinian leaders who were willing to go very far in order to end the Israeli occupation. Consequently, even the Palestinian Authority would find it had to admit, the Palestine for which it requests international recognition nowadays – in practice a small Bantustan on parts of the West Bank. As long as the peace effort is directed from the West and led by the United States these are the basic assumptions on which everyone operates: the Israeli peace camp, the Palestinian Authority, the Israeli government etc. These assumptions and the process they produced fed successful careers and enriched quite a large number of individuals locally and abroad. The dividend was such that even when it was clear that the process did not produce a peaceful reality, nonetheless it was kept alive by these stakeholders and vested interests. The reality on the ground manifested clearly the outcome of these assumptions in 2015. Israel is slowly but steadily annexing almost half of the West Bank, besieging Gaza to death (uninhabitable in a few years according to a new UN report) and strangulating the Palestinian minority in Israel through land expropriation, house demolitions and legislation. The inertia of politics, the timidity of the Western political elites and the horrific events in Syria and Iraq (and their impact on Europe) mean that it will take a while before the West reformulates a new approach towards Palestine. Without such a reformulation, there is an acute existential danger for the Palestinians wherever they are. Outside the West, there is no such inertia nor such legacy that should blind politicians to the possibility that values such as justice and reconciliation should be an integral part of a peace process. The changing international scene should enable us to elicit the support, outside the West, for a new way of thinking about Palestine. We should be able to talk freely in South America and South Africa about Zionism as colonialism and of Palestinian resistance as anti-colonialist, without immediately being branded as anti-Semites. Moreover, describing the Israeli policies inside Israel as Apartheid policies, as ethnic cleansing in the West Bank and genocidal in the Gaza Strip will rightly be understood outside the West as stemming from deep concern for human rights, and not a sinister anti-Semitic ploy. Exceptionalism will not work that well as a shield for Israeli impunity on the ground. There is one additional advantage to expanding the engagement with Palestine beyond the West. The main lesson from the less appealing aspects of post-Apartheid South Africa is the need to tie in socio-economic reforms with political change. It is impossible to dissociate the pax Americana in Palestine from the neoliberal culture of the West. Since 1993, Western donors gave $23 billion to sustain this false peace process. Money that created a worse economic and social reality than the one prevailing before 1993. Had they associated social justice with human rights in Israel and Palestine, with one tenth of the sum they could have created a thriving democratic and just state instead of the apartheid regime now in power. The lessons from South Africa and the lively and important debate in South and Central America on social justice, along with the agenda of human and social rights, are new and necessary angles for engaging with Palestine. Zionism cannot be defeated by the old notions of nationalism alone nor is the West the key for change anymore. To confront it you need a wider geographical, conceptual and ideological alliance. It is time to seek new allies and work closely together with them for a free Palestine.